"The places I visit in my paintings are reconstructions of another time, a sense of place shaped through distance and memory." Spawned from memories of the past, and the people and places that were dear to him, Barry Carlsen paints intimate landscapes that act as emotional vignettes. More than a visual diary, the paintings are for Carlsen a tool for self-discovery that balances personal and broader symbolisms. Carlsen's works in oil are characterized by luminous surfaces that reflect a deep attention to light. 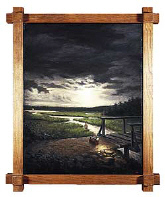 Framed in handmade designs crafted by Carlsen, each painting is an homage to place and memory. There is more information about Barry at www.wisconsinacademy.org.